The Pope in Ireland: Family and "Love in the Heart of the Church"
Yesterday, Pope Francis' apostolic visit to Ireland for the World Meeting of Families came to an end. 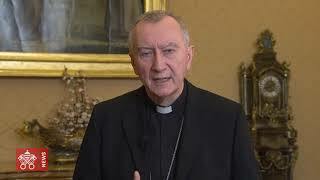 We publish his homily delivered in Phoenix Park, Dublin, on August 26. Chiara, a wife and mother, died in 2012 to give birth to Francesco. The gladness of her “yes” to Christ still generates fruits today. Six years from her passing, the diocese of Rome took the first step toward her beatification. French Cardinal Jean-Louis Tauran, President of the Pontifical Council for Interreligious Dialogue, passed away on July 5, 2018. In the June issue of "Traces," we published the historical speech he made Saudi-Arabia. We repropose it today. On Saturday, June 23, the ordination of new Fraternity of Saint Charles priests and deacons took place in Rome, Italy. We publish Fr. Julián Carrón's message to them. Ecumenism, "A Great Enterprise Operating at a Loss. But the Loss is Evangelical"
Pope Francis' words during the ecumenical prayer with the World Council of Churches in Geneva. The theme of his speech was "walking, praying, and working together." Selected passages from the speech given by President Emmanuel Macron to the Bishops’ Conference of France (Collège des Bernardins, April 9, 2018). From Traces, June 2018. Today the new papal document "on the call to holiness in today's world" was presented in Rome. "He invites you to go back to the time and place of your first love"
"Do we want to share in this message of life or do we prefer simply to continue standing speechless before events as they happen?" Pope Francis' homily for the Easter Vigil mass. On the fifth anniversary of the election of Pope Francis, we offer an annotated reading of Evangelii Gaudium to help grasp the essence his "programmatic text" and today's task for all men and women. Today, February 23, Pope Francis' Special Day of Prayer and Fasting for Peace invites us to remember the Democratic Republic of Congo and of South Sudan. Pope Francis on Msgr. Luigi Giussani: "Thus he educated in freedom"
On February 22, 2005, the founder of CL passed away. Ten years later, Pope Francis welcomed all pilgrims reminding them of "the good that this man did for [him] and for [his] priestly life." "May the light of Christ rising in glory dispel the darkness of our hearts and minds." Pope Francis' Lenten message to the faithful deemed this time a "sacramental sign of our conversion."